Pitcher - Raffaellesco style - 8 inches high x 5.75cm inches wide (20cm x 15cm). Holds 1 quart (1 liter). Tuscan Country Grapes Pitcher - 8.75 inches high x 9 inches wide at handle (17cm x 18cm). Holds 1 quart (liter). Tuscan Country Poppy Pitcher - 11 inches high x 10 inches wide at handle (28cm x 20cm). Holds 1 quart (liter). 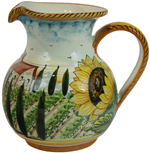 Tuscan Country Sunflower Pitcher - 8.75 inches high x 9 inches wide at handle (17cm x 18cm). Holds 1 quart (liter). Copyright © 2009-2019 Sorella Luna Inc.